Seven artists selected by an international jury for the 2019 Nova Prize are Abe Abraham, Mengfan Bai, Eero Jääskeläinen, Minju Kim, Yusuf can Kulak, Lily Reeves, and Kerstin Paillard. The exhibition, curated by Anthony Huffman, Baylee McKeel, Renata Baltar, and Shihui Zhou, thoughtfully reflects on human origins, civilization’s violent transformation of nature to forge the built environment, and attendant socio-environmental ailments linked to the embodies, postmodern urban experience. Our honorable panelists included Ulrich Baer (Professor of German and Comparative literature at New York University), Blake Carrington (artist and Assistant Professor of Digital Arts at Pratt Institute), and Katya Grokhovsky (artist, curator, educator, and Founding Artistic Director of The Immigrant Artist Biennial and Feminist Urgent). For the panel programming, click here. Dr. Ulrich Baer is Professor of German and Comparative Literature at NYU. He received his BA from Harvard University and his PhD from Yale University before joining the faculty of NYU in 1995. He is a widely published author, editor, and translator, and an expert on modern poetry, contemporary photography, literary theory, and philosophy. He has also published two books of fiction. Baer has been awarded a Guggenheim Fellowship, a Getty Fellowship, an Alexander von Humboldt Fellowship, and twice been honored by the NYU Faculty of Arts and Science Golden Dozen teaching award. He writes regularly on photography as a critic and commentator and teaches regularly in the Department of Photography and Imaging at Tisch. Blake Marques Carrington works within the spheres of the sound, visual and performing arts. His solo exhibitions feature a range of work from inkjet painting to video installation using custom software systems. Parallel to his work in the visual arts context, he writes and performs original audiovisual compositions and releases full length albums. Working collaboratively, he has created and performed concert visuals with Patti Smith and Soundwalk Collective, and co-founded a platform for contemporary video art projections in public spaces called Urban Video Project that featured the work of Trevor Paglen, Jill Magid, and Miranda Lichtenstein. Blake was born in Indiana and currently lives and works in Brooklyn, where he teaches in the Digital Arts Department at Pratt Institute. Katya Grokhovsky is an NYC based artist, independent curator, educator and a Founding Artistic Director of The Immigrant Artist Biennial (TIAB) and Feminist Urgent (FU). Grokhovsky holds an MFA from the School of the Art Institute of Chicago, a BFA from Victorian College of the Arts, Melbourne University, Australia and a BA (Honors) in Fashion from Royal Melbourne Institute of Technology, Australia. Grokhovsky has received support through numerous residencies and fellowships and has exhibited her work extensively. 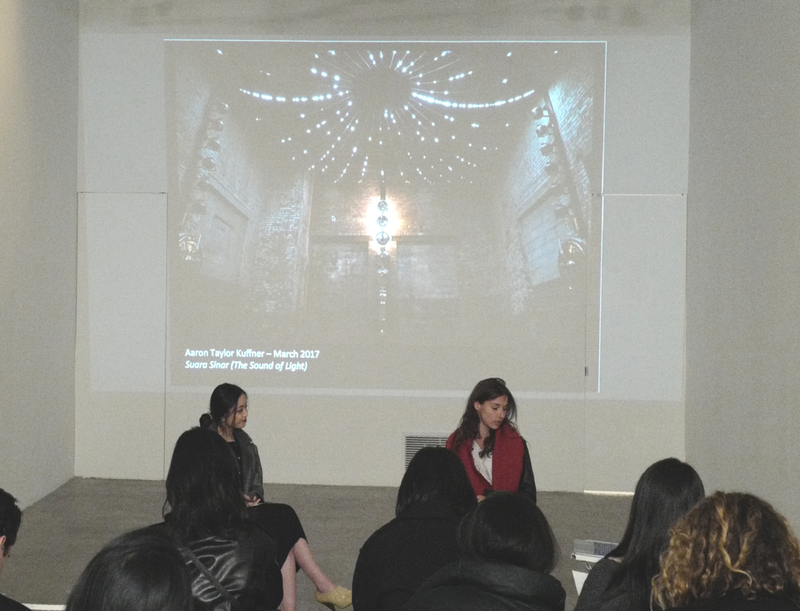 One of the founders and directors of The Chimney, an exhibition and performance space located in Bushwick, Jennifer Houdrouge discusses her experience as an art gallery director, from finding and utilizing the perfectly unique architectural space to symposiums and the gallery’s first publication. “A Conversation with Jennifer Houdrouge” continues the FRESCO Talk program, a series aiming to engage artists, gallerists, museums professionals, scholars, and collectors in conversation with the millennial generation. Ms. Houdrouge speaks about her curatorial process and the immersive environment that her and Clara Darrason seek to create at The Chimney. Playing on the rawness of its industrial architecture, all works are commissioned to interact with the space in order to create an engaging and interactive experience. Often working with multidisciplinary and international artists, she discusses the most fulfilling and challenging aspects as her job where the artwork or performance is as much on display as the architecture. 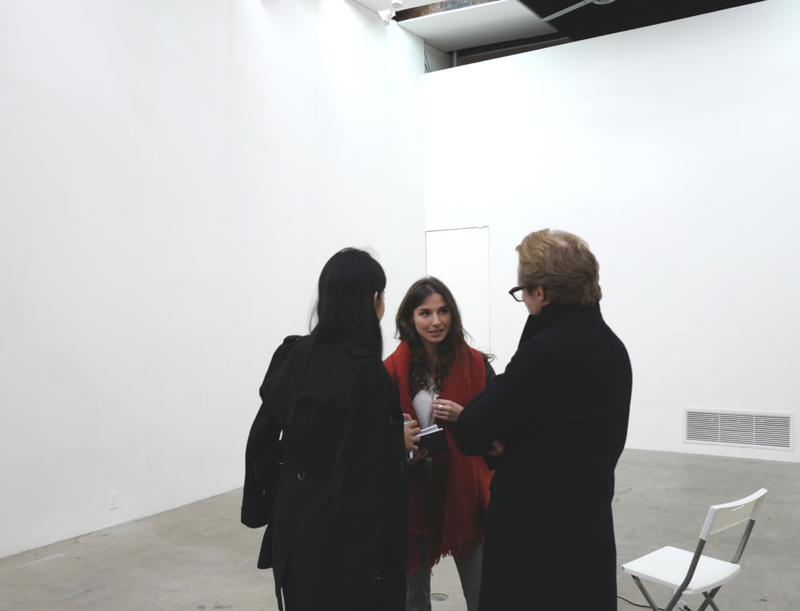 Her curatorial process is a layered one that must be involved with both the artwork and the art space, allowing the industrial setting of The Chimney to be an interactive part of the show along with its visitors. She also discusses the gallery’s publication, 2020, their annual festival, “The Chimney Festival” which began in 2016, and their recent symposium, “Re-considering Materialism and Artistic Agency in the Age of the Anthropocene,” sharing her thoughts on the intersection or art and ecology. Jennifer Houdrouge is one of the founders and directors of The Chimney, an exhibition and performance space venue located in Bushwick. The Chimney opened in 2015 and features shows that are curated to dramatize the space. Each exhibition explores the constraints and possibilities of the gallery’s unique architecture. Instead of a white cube, The Chimney is a windowless black box. Before founding The Chimney alongside Clara Darrason, Houdrouge worked as a curatorial intern at Guggenheim Museum and as an assistant to the director at Gladstone Gallery. In 2017, the pair was named one of the “Brooklyn 100 Influencers” by Brooklyn Magazine. Both are alumnae of Sotheby’s Institute of Art, where they met. The Yoruba prince, artist, and collector, Ómò Oba Adetomiwa A. Gbadebo, speaks about his use of the Yoruba language in his work and its sacred connection to spirituality. “A Conversation with Yoruba Royal Collector” continues the FRESCO Talk chapter, a talk series aiming to engage artists, gallerists, museums professionals, scholars, and collectors in conversation with the millennial generation. Mr. Gbadebo talks about using his heritage and experience as a Yoruba royal descendant, to produce his art pieces based on experiences and his emotions; in addition to incarnating a spiritual trance while he creates. The artist describes the process of forming multiple ideas in both his conscious and subconscious mind and the experience of developing them with the guidance of his Yoruba ancestors, Orisha’s, and Ifá philosophies. Gbadebo seeks to break the western comparison of his work to that of Jean-Michel Basquiat - as he opens a world invitation to approach African culture with an open mind. He tells us about his work across the work, his recent initiatives, his involvement in with the global art scene, as well as his upcoming art projects. Ómò Oba Adetomiwa A. Gbadebo was born into three royal families: the Gbadebo royal family of Egba Kingdom and the Ademiluyi family of Ilé-Ifè Kingdom as well as the Oshodi (Tapa) family from Lagos. Òmó Oba (Prince) Gbadebo uses his Yorùbá heritage and life experiences to create his pieces based on emotions and the journey that life stitches; he embodies a spiritual trance while he creates. As an artist, Gbadebo seeks to push humanity to see what they are choosing not to and to question all conscious solutions given. All of this, with the mindset of selflessly aiming for positive and forward transcendence equally for all alike and different. Gbadebo implements the use of rocks and other organic ready-mades in work, an intuitive and fierce visual style, at also telling of his very spiritual and ritualistic connection to his work - or as he states "It's beyond the human realm." Gbadebo, aside from exhibiting in numerous international art fairs mentioned as above; is also the CEO and founder of Ori Consulting Group (Oriifa). Ori Consulting Group is a company that focuses on positive development across Africa as well as other global landscapes. Currently, Ori consulting groups focus on the arts and culture sector. 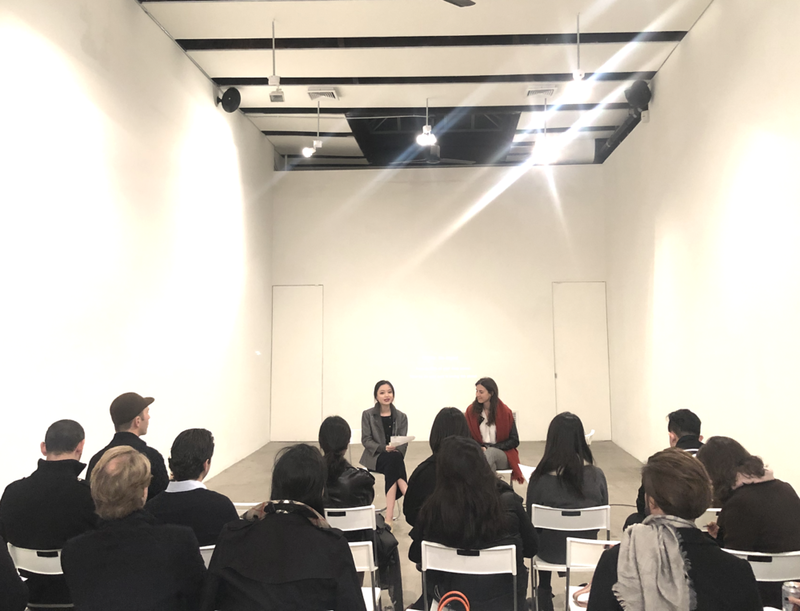 “Insights From A Millennial Collector” introduces the first edition of FRESCO Talk, a talk series aiming to engage artists, gallerists, museums professionals, scholars, and collectors in conversation with the millennial generation. From old masters to the rising generation of artists, Roy Huang speaks on his collecting trajectory and offers personal opinions on how to establish a collection of historical significance. An avid collector and active patron of art institutions, the speaker demonstrates how he approaches artists and acquires their monumental pieces. Roy also points out the key information he looks for when evaluating an artist or work of art, especially at a burgeoning stage of street artists, and his approach to such information. The foundation is honored to have some of Roy’s early acquisitions showcased during the talk. 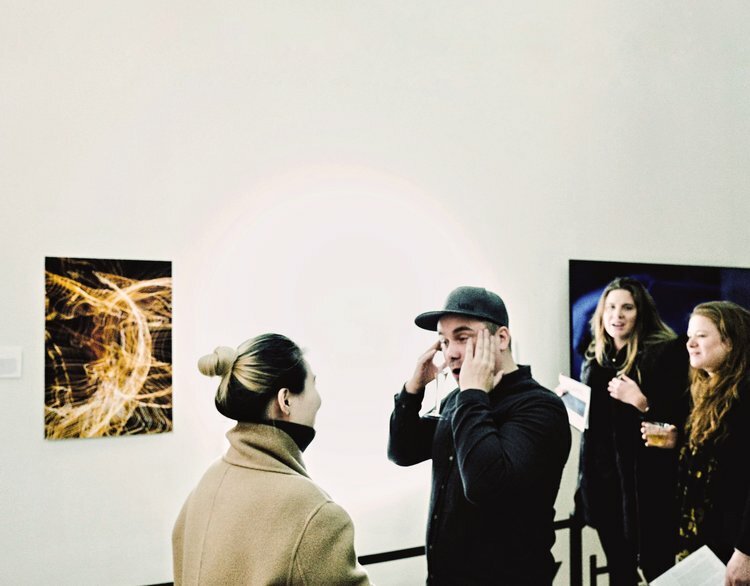 Artists, designers, and young collectors were invited and joined discussions at the reception.